These are the different options of going around Johor. To find out how to get to Johor, look here. Getting around Johor can be a bit tricky if one doesn’t have an experience driving there. But the roads in general are safe and well maintained. Most of the areas in Johor are well connected especially on the west part. There are several highways built to ease the traffic and shortened the distance from north to south and from the city center to the east area. Getting around the capital city,Johor Bahru with private vehicle is a bit easier with GPS navigation. Most of the attractions can be located via the GPS navigator. Bus is the main public transportation service available in Johor. There are at least seven bus operators in Johor. 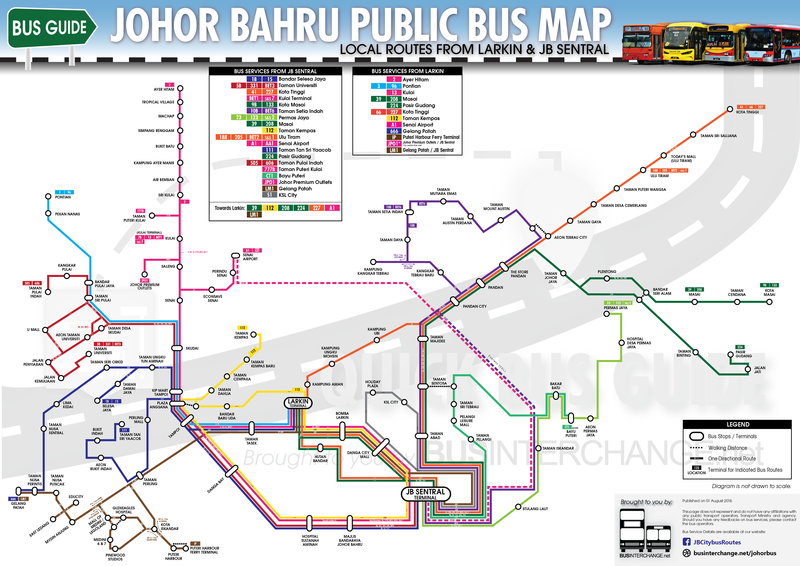 Each of the bus operator provide a wide public transport network coverage around Johor especially in Johor Bahru. Normally, the bus routes would start from and end at JB Sentral or Larkin Bus Terminal. Some of the bus operators serves the same route while some serve a designated route.The fares for majority of the buses are usually cheap and allow travelers to travel inexpensively to different parts of this beautiful city. The downside of the bus service is that frequency of the buses is not consistent. Taxi is a convenient mode of transportation but can be pricey. Just like everywhere else some drivers don’t play by the rules. Just make sure that the driver is willing to use the meter before riding the taxi. E-hailing service like Grab is available in three cities in Johor. Johor Bahru, Batu Pahat and Kluang. It is the alternative for the taxi service. The app can be downloaded before the booking. The fare can be paid by cash or credit/debit card. It is by far the most convenient and cheapest way to commute. The drivers are also experienced locals who can share some tips about Johor.